I love being out in the great outdoors, away from the cities, enjoying natural beauty. This isn’t something I get many opportunities to do anymore. Which is why I was so excited to adventure with some of the ladies from Girls Love Travel around Glendalough. My husband and I are still settling into our new apartment which as it turns out is less than 20 miles away from this beautiful location. 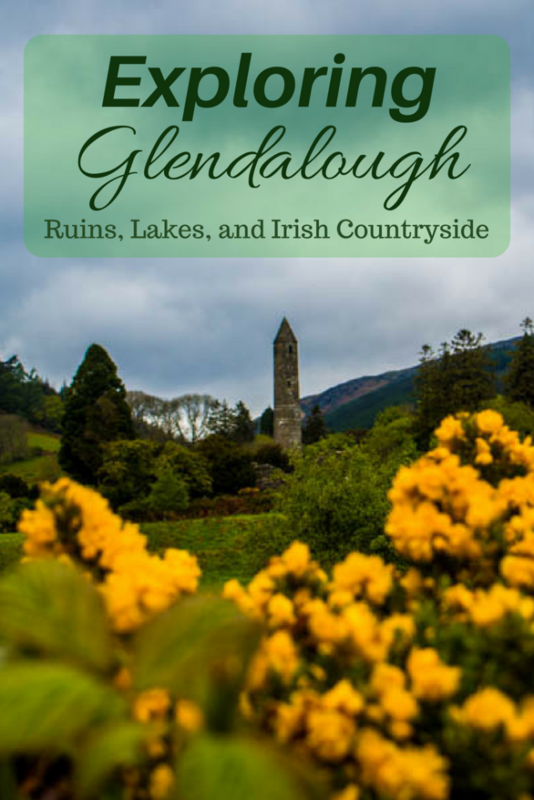 If you’re lucky enough to visit Ireland on a sunny day, or you don’t mind getting wet Glendalough is possibly the very best day trip from Dublin that you could ask for. It has countryside, it has villages, there are ancient ruins and beautiful lakes. 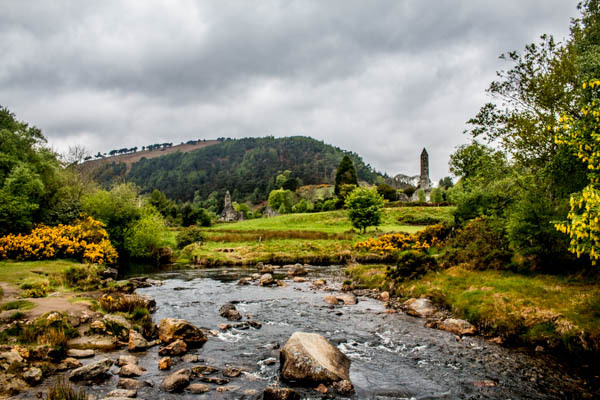 Getting to Glendalough from Dublin is incredibly easy to do and unlike most ruins in the countryside in Ireland, you don’t need to drive to get to it. Because Glendalough is such a popular destination there is a private bus service that runs between Dublin and Glendalough several times a day. You get the bus outside St. Stephen’s Green in the same place where the Viking Splash Tour starts. It is called St. Kevin’s Glendalough Bus and costs €20 for a round trip ticket in 2017. You’ll buy the ticket as you board the bus. The alternative is to drive there and pay a small fee for parking. The first thing you see when you arrive is the Glendalough Visitor’s Center. Here you can take a bit of an indoor tour and learn about the history of the area. This is also the location of the bathrooms. Of everything at Glendalough, this is the only part that is entirely skippable. We used it to escape a bit of rain before we set out. 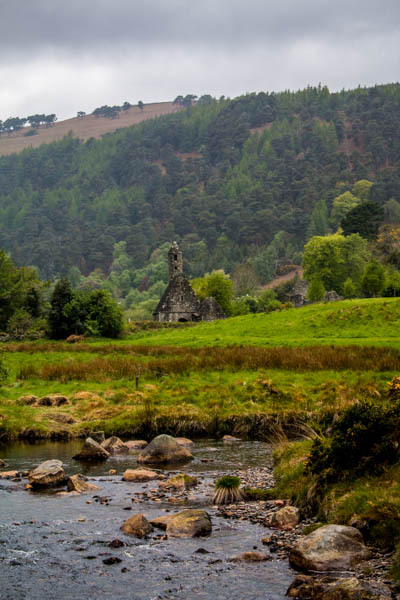 The biggest attraction of Glendalough is without a doubt the ruins of a monastic settlement dating back to the 6th century. The most striking of which is the massive Round Tower which stands 98 feet into the air. It also has several other buildings you can walk around as well as a cemetery with the iconic Celtic cross marking many of the graves. There are other ruins scattered throughout Glendalough as well which we didn’t get the chance to see. That just means we have to go back sometime! I also wasn’t able to see everything at the ruins because of the lack of accessibility. But more on that in an upcoming post. Once you’re finished at the ruins the nature portion of the trip begins. You’ll have two path options. The first takes you uphill where you get some great views of the ruins and you find yourself feeling secluded. We chose to take this path on our way back. It was a lovely adventure, though the path could really use some paving. The path that stays down on the valley floor is the one we decided to start with. It is a raised platform that takes you over bogs and past a herd of sheep. Lucky for us we were there in time to see some adorable little lambs out with their mothers. Kidnapping may have been considered, especially of this adorable little black fellow! For a short time, the field of sheep turns into a tightly packed forest until you pop out at the Upper Lake parking lot. The Upper Lake parking lot has much more than just places to park. It’s also the home of several small food vendors. Here you can get chips, burgers, ice cream, and a variety of drink options. The food itself isn’t anything to write home about. I’m pretty sure that my chicken nuggets were made from frozen. But for a quick refuel to keep you going it isn’t bad. The Upper Lake is beautiful. After eating we took the short path to the beach and the entire group let out a gasp. We went from being surrounded by trees to this gorgeous wide open view. We all stood around for a few minutes, getting those Instagram photos and getting photos of the ducks. Sadly at this point, it was time for half our group to turn back, myself included. All of this is really just the tip of the iceberg that is Glendalough. There are tons of trails to wander, including the famous Wicklow Way which goes for 81 miles from the suburbs of Dublin, through Wicklow county and ends in Clonegal, County Carlow. Another popular attraction at Glendalough is the rock climbing. The quality of the climbs along with the variety of grades makes it an attractive place for climbers of all levels. The trip to Glendalough is a gorgeous one. If you’re lucky enough to have a car you’ll be able to jump out and see the countryside without having to go very far from Dublin. There are also a couple of hotels and a hostel right across the street from the ruins if you’re interested in spending the night. This is ideal for photographers who want to catch that blue hour sky. Obviously, I’ve not stayed in any of these yet, but I can certainly see the appeal! 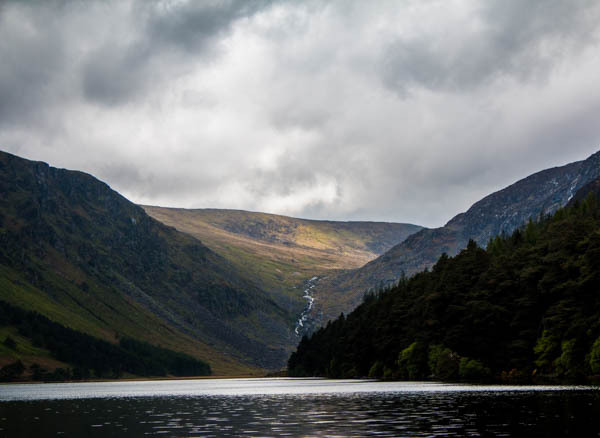 Its proximity to Dublin makes Glendalough an excellent day trip, one that I highly recommend. If possible try to go during the week when there will be fewer people. And if you aren’t afraid of getting wet you’ll practically have the place to yourself if you go while it’s raining! As I said at the start, the wheelchair situation there is a little bit rocky. I’ll go into more detail here. If you’d like to explore more of Ireland see what our friends at Your Irish Adventure have been getting up to.